Use a towing dolly or flat bed truck. The engine is running, but the vehicle will not move. The vehicle makes an abnormal sound. If a tow truck is not available in an emergency, your vehicle may be temporarily towed using a cable or chain secured to the towing hook(s). This should only be attempted on hard, surfaced roads for short distances at low speeds. The engine must be in ACCESSORY mode (engine off) or IGNITION ON mode (engine running). Put the shift lever in “N”. Avoid sudden starts or erratic driving maneuvers which place excessive stress on the emergency towing hook and the cable or chain. Always be cautious of the surroundings and other vehicles while towing. If the engine is not running, the power assist for the brakes and steering will not function, making steering and braking more difficult. Never tow this vehicle with the wheels on the ground. 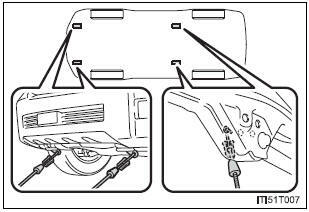 Use only the front emergency towing hooks or towing eyelets (depending on vehicles) when towing your vehicle. Do not tow with a sling type truck, either from the front or rear. Use a towing dolly under the rear wheels. Use a towing dolly under the front wheels. Do not tow the vehicle with the “ENGINE START STOP” switch OFF. If your Toyota is transported by a flat bed truck, it should be tied down at the locations shown in the illustration. 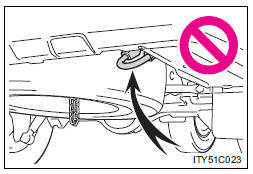 When attaching the hooks to the rear of the vehicle, make sure to attach them to the inside of the vehicle. Do not use the rear emergency towing hook.